Kia Motors (www.kia.com) and Hyundai Motor have announced plans to introduce ‘solar’ charging technology on selected Hyundai Motor Group vehicles by incorporating electricity-generating solar panels into the roof or the bonnet, thereby giving these internal-combustion engine (ICE), hybrid and battery electric vehicles additional electrical power and increasing their range. Hyundai Motor Group (www.hyundai.com) is developing three types of solar roof charging systems. The first-generation system is for hybrid vehicles, while the second-generation technology is a semi-transparent solar roof system for ICE vehicles. The third generation will be a lightweight solar roof for battery electric vehicles. The first-generation system — created by integrating silicon solar panels into a standard car roof — can provide 30-60% of a battery’s charge over the course of a normal day, depending on weather conditions and other environmental factors. 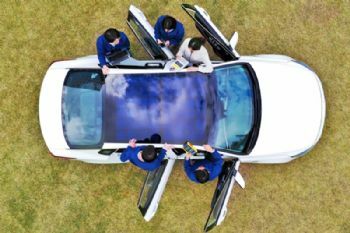 The second-generation semi-transparent solar roof for ICE vehicles can be integrated with a panoramic sunroof, letting light through into the cabin, while at the same time charging the vehicle’s battery. The third-generation system is currently in testing. It is designed to be applied to the bonnet and roof of battery electric vehicle models. Jeong-Gil Park, vice-president of Hyundai Motor Group’s engineering and design division, said: “In the future, we expect to see many different types of electricity-generating technologies integrated into our vehicles; the solar roof is the first of these technologies.